These gluten-free salted tahini chocolate chips are refined sugar free and yet perfectly chewy and delicious! According to my picky kids, they taste a lot like regular chocolate chip cookies! I think we’ve already gathered that I loooove dessert. 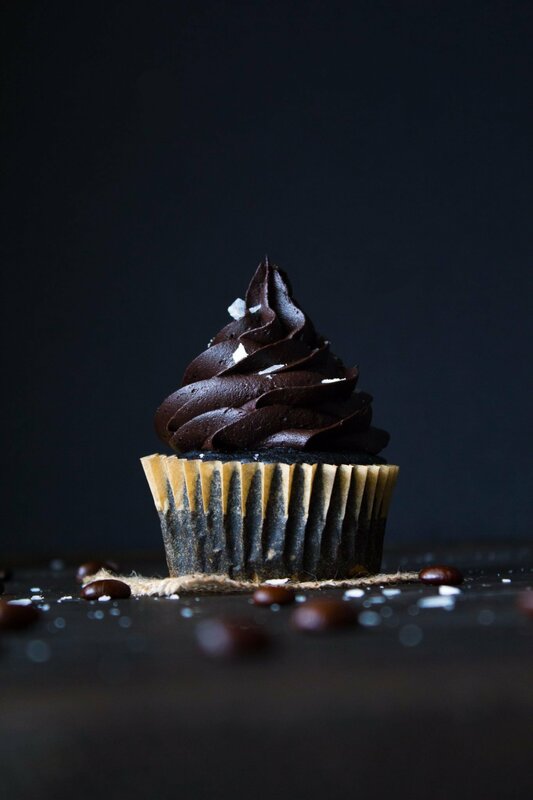 The majority of the recipes on this blog are probably sweet treats, (#sorrynotsorry 😉 but at least they’re all made with unrefined sweeteners!) and chocolate chip cookies have to be up there near the top of the list of one of my faves…especially when they’re warm and gooey, fresh from the oven! I had a few jars of delicious tahini I had gotten from Seed + Mill that I wanted to use, but instead of just making a bunch of hummus, I wanted to try it in a dessert. There are a lot of creative ideas out there, but since my kids aren’t typically fond of the strong flavor of tahini, I decided to use it in a way I knew they would enjoy it—in chocolate chip cookies! Refrigerating these cookies is an important step as well. It chills the butter, which helps the cookies to stay thick and chewy when baking. It also softens the flour a bit so the grainy texture that gluten-free flours are infamous for was almost nonexistent after chilling the dough overnight. Finally, a pinch of flaked sea salt took these over the top—Salt and chocolate chip cookies are like a match made in heaven! Especially when paired with a big glass of almond milk! Mmmm…so good! 😋 Enjoy, friends! 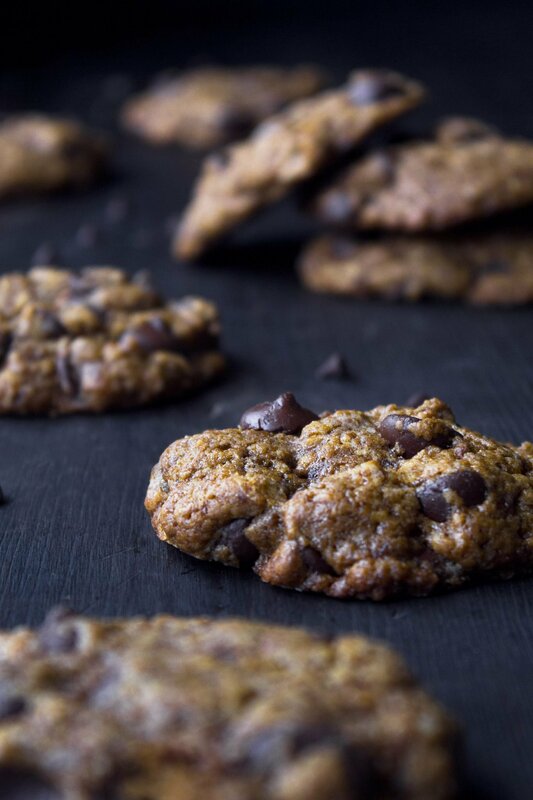 Chewy chocolate chip cookies that are free of gluten and refined sugar! A hint of tahini make these cookies a little extra special! In a bowl, blend together flours, xanthan gum, salt, and baking soda. Set aside. Place melted butter, tahini, coconut sugar, and maple syrup into a mixing bowl and beat until thoroughly combined. Add egg, yolk, and vanilla and beat until batter is smooth. Stir in chopped chocolate until evenly distributed. Refrigerate cookie dough until firm, at least 1-2 hours or overnight. After dough has chilled, preheat oven to 375F. Line a cookie sheet with parchment paper and scoop dough out by the rounded tablespoons (I also like to use ¼ cup for larger cookies) placing 2-3 inches apart. Flatten slightly and top each with a pinch of flaked sea salt. Place pan onto the middle rack in the preheated oven and bake for 12-14 minutes, until cookies are golden brown and center is set. Let cool slightly on the pan before transferring cookies to a rack to cool completely. Store leftovers in an airtight container for up 2-3 days. Adaptation of this recipe from Alton Brown. I NEED that chocolate chip cookies in my LIFE. OH MY GOSH. I love how gooey and chewy these look!! Your photography is breathtaking! Well done! Wow these salted tahini cookies look absolutely delicious! I don’t think I’ve ever thought of salted ones before but your beautiful food photos just wowed me. These look so tasty — and your food photography is incredible! It has such a clear aesthetic/brand. Thank you, Lora! I really appreciate your encouragement! Ohhhh I love that you made cookies with brown rice flour! I’ve been meaning to try baking with that flour but just haven’t gotten around to it yet— so now I MUST try these. I’m so curious about the tahini too! It so good girl! Thank you for being willing to try it out. Please let me know how you like it! 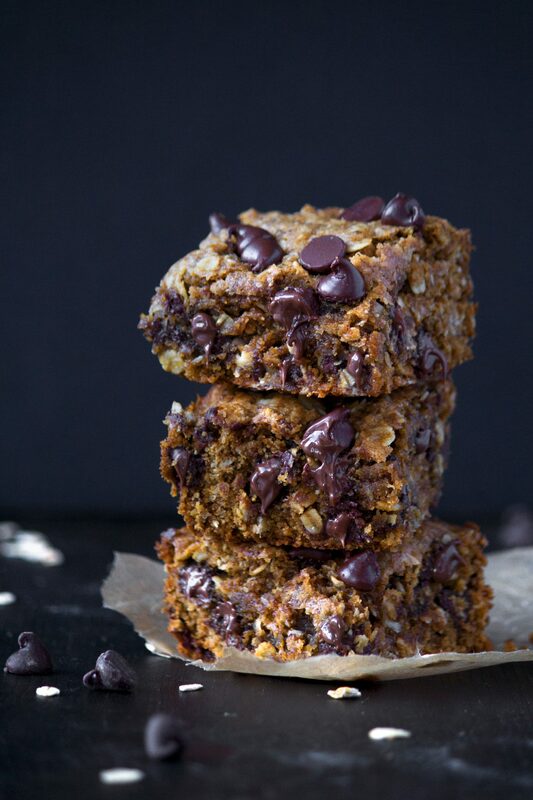 Wow, these gluten free salted tahini chocolate chip cookies look so delicious! I will have to try your recipe soon! Thank you for sharing! Thank you for your encouragement, Ashleigh. I hope you’re having a wonderful weekend! Oh yes, most definitely. I love this recipe! These legit look AMAZING! I am definitely going to have to try these out… sorry not sorry!!! OMG these chocolate chip cookies look ahmazinggggg! I never would have thought to use tahini, I love it but I’ve never had it in cookies! I bet it lends such a delicious flavor! I also love the flaked sea salt on top of the cookies….the perfect touch! OMG these chocolate chip cookies look ahmazinggggg! I never would have thought to use tahini, I love it but I’ve never had it in cookies! I bet it lends such a delicious flavor! I also love the flaked sea slat on top of the cookies….the perfect touch! Hi, friend. It really does lend to a delicious flavor. There’s something so great about salty and sweet. Thank you for your encouragement. I hope you’re having a lovely weekend!